Time was when footballers had much in common with the supporters who watched them. Until 1961 a maximum wage of £20 per week was in force, which meant that the gap between the salaries of the top footballers and the fan in the street was not massive or insurmountable. Fans would travel to and from matches on the bus and would very often bump into some of the players they had just cheered or booed from the terraces. Thanks to the sterling work of Jimmy Hill and the PFA, the maximum wage was scrapped, Johnny Haynes was awarded the massive salary of £100 per week and footballers were finally and correctly treated as the entertainers they were and the void between the player and the fan grew ever wider. That being said I recently wrote the biography of a lower league journeyman, Bob Booker, who played for Brentford and Sheffield United between 1978-1993. He joined the Bees as an apprentice upholsterer on piecework earning between £170-200 per week, good money in those days. He exchanged the security of a job for life for a one-year contract with Brentford at £60 per week. As a lower division footballer he was seen as easily replaceable and it took him until 1986, eight long years on, for him to earn £200 per week as a professional footballer and catch up to where he had been before he came into the game. Like most players of his time he had no security, worked on a series of one-year contracts and he would be handed a new contract at the end of each season, given a pen and told, “sign here.” Negotiation was unheard of and he just felt grateful to still be in a job. The bad old days are long gone and now it is the player, particularly those at the top end of the game that calls the tune and possesses all the power. Football books used mainly to be anodyne ghost written autobiographies of the stars or leading managers. How things have changed. Supporters bombarded and fuelled by a constant stream of information and consciousness on social media and in the press are more demanding than ever and take a vicarious delight in learning what happen behind the scenes. Now a leading sports lawyer, Daniel Geey, has granted their wishes with the long overdue publication of “Done Deal,” a book which provides a comprehensive, insightful , fascinating and all encompassing overview of how the game is really run and how in most cases how it is now the players and their agents who call the tune. The game has finally turned full circle. Geey has wide experience of advising players and clubs alike as well as rights holders and other sports companies. He ranges from topic to topic and in clear and succinct prose, studded with case studies and examples, he provides the answers to the questions that most fans, and indeed even those working within the game would like to pose. Most appropriately, I am writing this review on Transfer Deadline Day and Geey explains the dynamics behind a deal and covers every aspect that needs to be covered off and how things can so easily go wrong. Personally I have always found it hard to understand how an agent ostensibly working on behalf of a player can be paid a fee or commission by the club rather than by his client in what seems like a clear conflict of interest but this, and various other anomalies and even perhaps weird practices are covered clearly and explained by Geey. The timing of this book is also highly relevant given the tragic situation of Cardiff’s new striker Emiliano Sala, recently lost without trace after his private plane had gone missing. Now is the time for mourning rather than recriminations but you can only begin to think about the knotty legal issues and questions that will at some time soon need to be dealt with in terms of liability, insurance, the payment of the transfer fee plus many others. Geey sheds light on some of the weird and wonderful contractual clauses put into player’s contracts such as Neil Ruddock’s famous weight clause and Barcelona agreeing to fly over Neymar’s friends from Brazil to spend time with him in Spain every two months – you’d think the player could have easily afforded to pay their costs himself but it was the club who footed the bill! Some seemingly astute businessmen seem to switch off their brains when they involve themselves in football and become totally star struck and it was good to be reminded of Mark Goldberg spending £22.8 million to buy Crystal Palace but still having to lease the stadium, Selhurst Park from Ron Noades and also paying Terry Venables a fee of £135,000 simply to open talks about becoming the manager of the club. Crazy times! Geey explains how the work permits system works and the potential problems that BREXIT might cause for the game as well as covering the thorny question of media and broadcasting rights and television fees. Every chapter contains fresh nuggets and it is illuminating to read about how so many footballers have fallen foul of social media through misguided and Ill-thought through tweets and also to recap Nicolas Anelka’s appalling quenelle gesture which deservedly cost him a ban of five games and a fine of £80,000. This is a comprehensive and illuminating primer for anyone interested in how the game operates today and fully emphasises the importance of providing watertight legal agreements to cover all eventualities. Geey will not win any style points or prizes but the book flows and is an easy and illuminating read that is highly recommended. 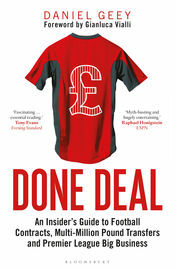 “DONE DEAL” BY DANIEL GEEY IS PUBLISHED BY BLOOMSBURY SPORT AND COSTS £16.99. KINDLE VERSION IS ALSO AVAILABLE.